Throughout our homeschooling years, one constant has remained: exploring the interests of my daughter using a multitude of resources. Now that Amber is in the last months of 10th grade, we find her focus to be narrowed and her goals specific to graduation. This means we no longer need a bevy of homeschooling curriculum to satiate her curiosity. Although when one of our long-time favorites, HelpTeaching.com, came up for review, we couldn't help but volunteer. Having access to Help Teaching Pro allows Amber to explore the site lessons for reinforcement of her current school subjects as well as additional topics that may peak her interest. We were given a full year to use the Help Teaching Pro, which will take my student through the majority of her junior year! HelpTeaching.com is an educational site unique in it's format and services. You would expect educational sites to have printables for a variety of subjects. However, HelpTeaching.com is so much more than a repository of printables. One of our favorite parts of HelpTeaching.com is the online lessons. 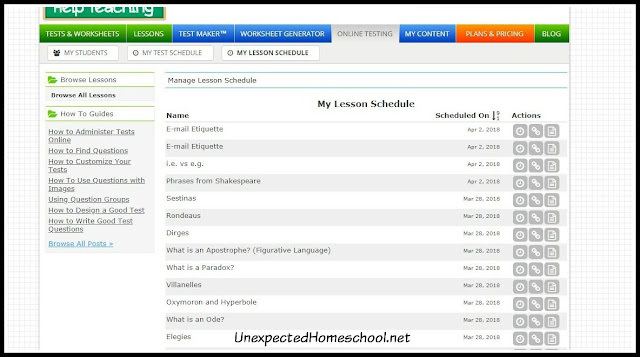 The lessons are sorted both by grade level and topic, and cover English Language Arts, Science, Social Studies, and Math. 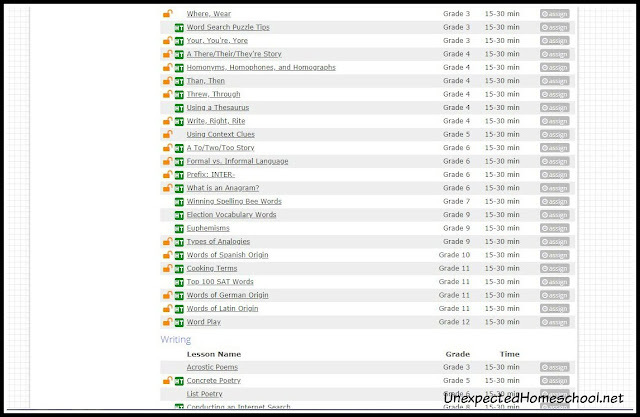 Each of these major topics have an array of subtopics, which are also identified by grade. 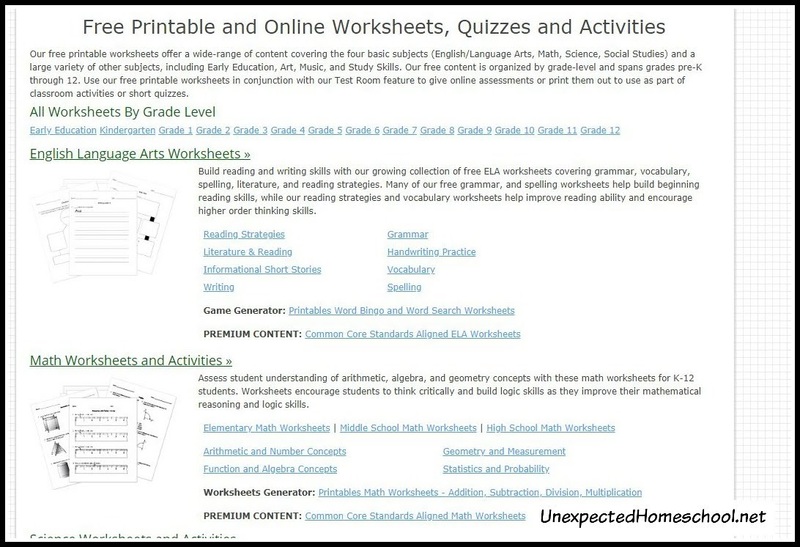 The lessons are a collection of resources, including video instruction, text, images, worksheets / tests to help your student with self directed learning. The videos are sourced from Khan Academy, Educator.com, Bozeman Science, or created specifically by the HelpTeaching.com team. Lessons sourced from outside of HelpTeaching.com are free to view, while other content is restricted to Help Teaching Pro members. The lessons can be assigned through the teacher account to any of their students - who do not an account. Then the teacher can track the students' progress which includes time spent, completion status, and scores on tests. 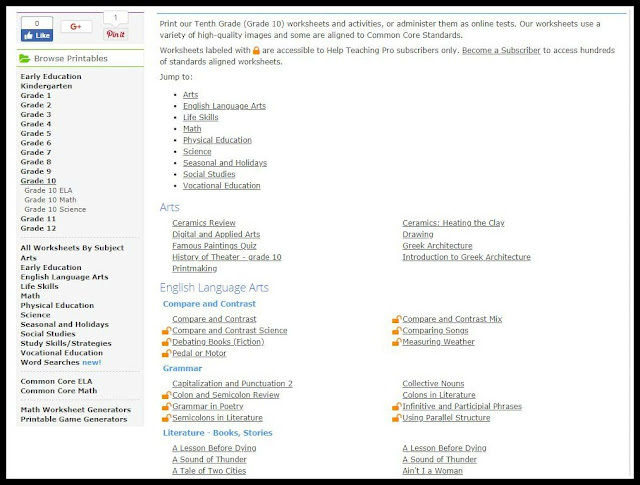 A small selection of the lessons, which are easily assigned through the far right "assign" button. The Test Maker feature is a powerful option that allows you, as the teacher, to create your own tests, quizzes, and worksheets. 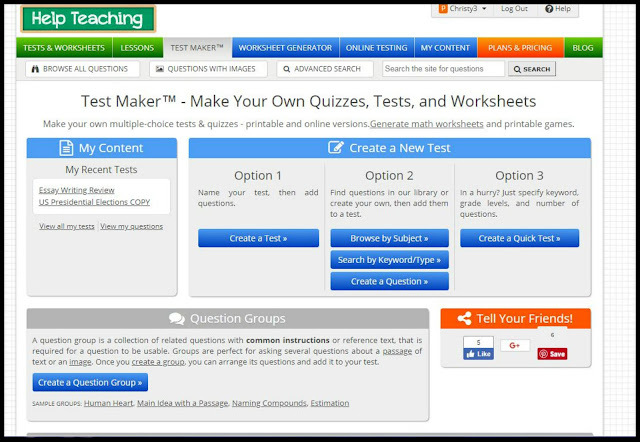 You can make a fully custom test with all of your own questions, choose to select questions from a bank of questions already in HelpTeaching.com, or select from a list of existing tests / worksheets on your topic. It really depends on your available time and needs. You are not limited to text only simple questions. Questions can contain images, or even be grouped together as in the case of questions that refer to a reading passage. Additionally, questions can be multiple choice, true / false, fill in the blank, or open ended. Math equations are a breeze to format as well. This truly is a fully customizable function. After designing a test, it stays in your account indefinitely for repeated use. You simply need to assign it to a student and they have the option to print the test or take it online. Some portions of tests can be automatically graded too, while other portions will be sent on to the teacher for evaluation. The teacher retains full control of the scores though, and can mark an answer correct even if the automatic grader has it set to incorrect. This is an option that makes using the question bank even more effective, since the teacher has the power to alter answers if they do not agree with how the original writer answered the question. I did make a test for Amber's essay writing course, but decided not to use it after seeing her most recent rough draft. Another free portion of HelpTeaching.com is the printable math worksheet and game generator section. Although this is not something my high school daughter has used, I can see the value in this feature for younger children. It would even be great for homeschool co-op teachers who need some fun activities for their classes. HelpTeaching.com kindly provides a large portion of their features for free, still we always find ourselves grateful for our Help Teaching Pro access. Both the Pro and free access allow for the creation of unlimited tests and worksheets, while only the Pro access allows for questions with images, saving your own created tests as PDFs, and use of pre-made premium content. 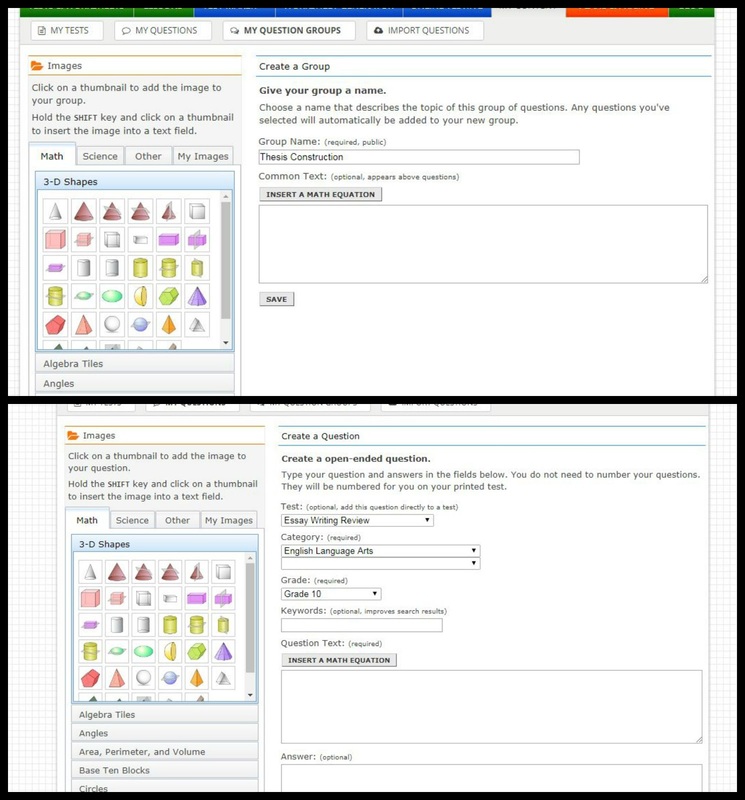 Tests and worksheets in the free accounts can have a maximum of 10 questions, while Pro accounts are limited to 100 questions. Lastly, the Pro access also grants unlimited access to the Test Room to administer the online tests and lessons, while the free version does not have this access. Unlike the previous time when we reviewed HelpTeaching.com, Amber did not have a course in need of supplementation. In fact, she is at the finish line with her science credits and math is never a good way for her to review a product. 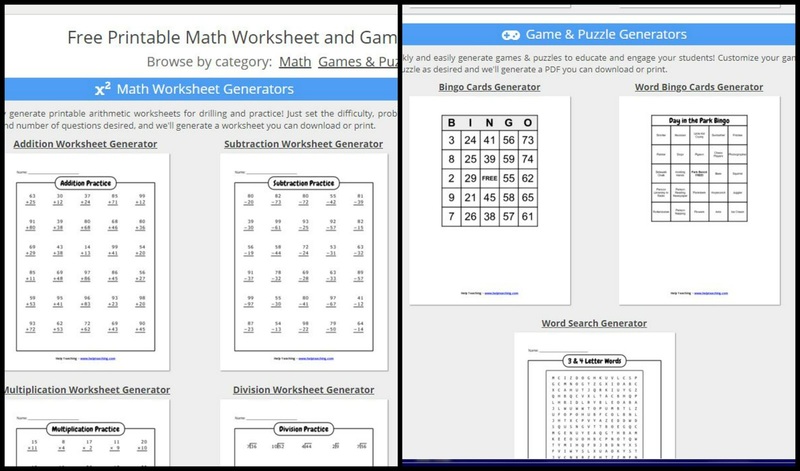 Additionally, we are not fans of printed worksheets, and while HelpTeaching.com has a fantastic assortment of worksheets, they are not the reason we enjoy the site. Instead, I looked through the high school English Language Arts lessons to find topics I thought would interest Amber as well as further her knowledge. Lessons on hyperbole, villanelles, dirges, and other reading strategy items all met my criteria, and were easily scheduled for Amber to use. I threw in a lesson on email etiquette, simply because she does not email much except with her friends. Assigned lessons. I can see her progress when clicking on the Actions buttons. Having already used HelpTeaching.com regularly, Amber knew the drill when she received the email links to the lessons. However, I failed to note when I wanted her to do the lessons, so she waited rightly assuming I would instruct her on the proper timing. I was ever so thankful that she waited too, when I had yet another teacher sick day and needed pre-planned lessons of appropriate difficulty. She worked in one room away from me, while I watched her progress through my iPad in a haze of exhaustion. Oddly enough, none of her previous ELA curricula have covered all of the topics I selected, which made those lessons a perfect complement to her current English course. 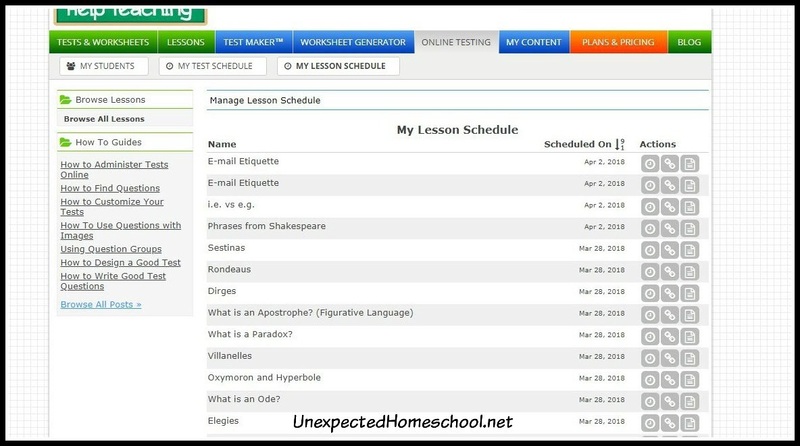 When needing a quick lesson with multiple components, I often find myself searching on HelpTeaching.com for a grade appropriate lesson. 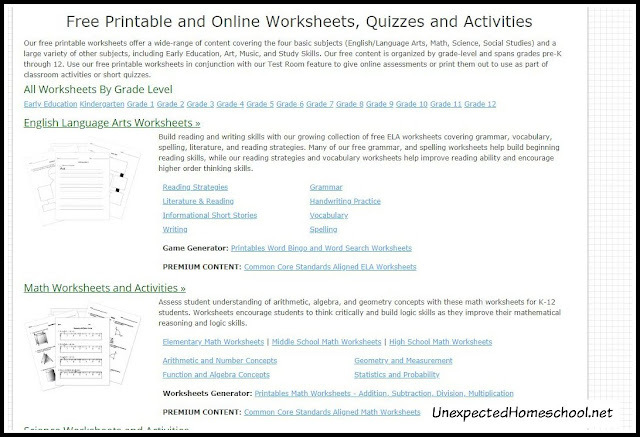 I'm not a big fan of tests and we don't use worksheets too terribly often. However, having lessons prepared with text, video, and review questions are a perfect fit for my needs. I'm sure we will continue to utilize HelpTeaching.com for the remainder of high school! 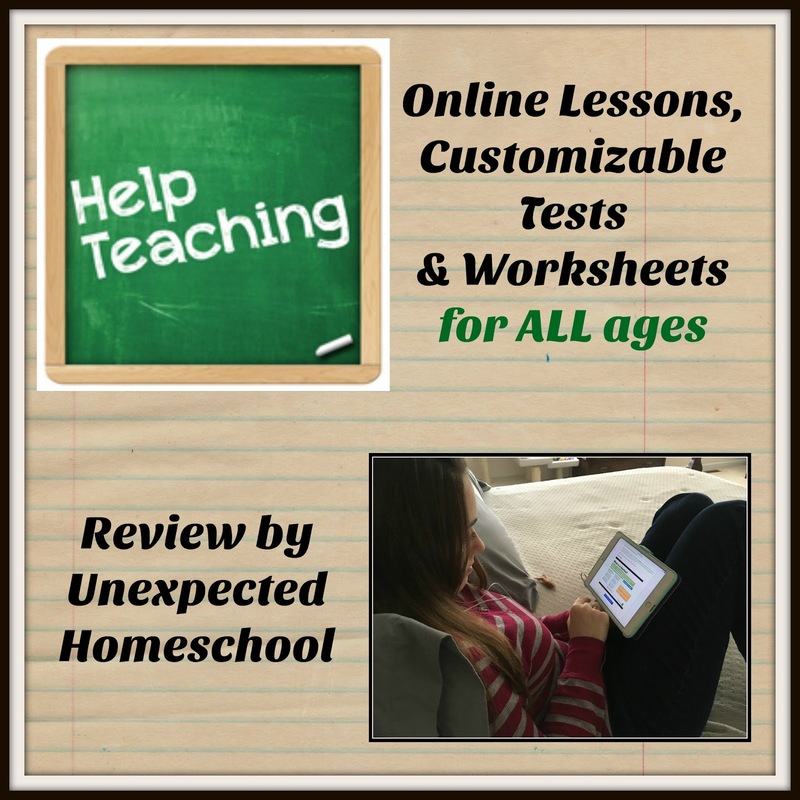 Other members of the Homeschool Review Crew also reviewed HelpTeaching.com. Please follow the link in the graphic below to read their thoughts.